A two-year-old girl who died from a blunt force injury to her liver was "like a rag doll" when paramedics arrived at her Peterborough home, a court has heard. Amina Agboola, of Scott Drive, Yaxley, was treated at the scene on 21 November but died later in hospital. Her mother, Sarah Racqueman, 29, denies causing or allowing her death. Ms Racqueman's boyfriend Dean Harris, 19, denies murdering Amina but has admitted a charge of manslaughter. Cambridge Crown Court heard that social services staff had warned Ms Racqueman not to leave her child alone with Harris, who had a history of domestic violence with a previous partner. When paramedics arrived on the morning of 21 November, Harris told them Amina had fallen off the toilet, Zoe Johnson, prosecuting, said. Soiled nappies and clothing found at the house were "the trigger that unleashed Harris's anger towards Amina", she said. While on remand, Harris told a fellow inmate he was a "psychopath" and confessed to lashing out at Amina after becoming frustrated that she kept soiling herself, Miss Johnson added. 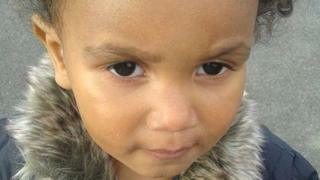 An inquest heard the child died from a ruptured liver and "blunt force trauma" to her abdomen. Her liver had been split in two, the court was told, and there was evidence of older injuries on her body including a recently broken arm, bruises to her face and skull, and bite marks on her cheek and forearm. Harris later accepted he had kicked Amina in the stomach but said he did not intend to cause her serious harm. The court heard Ms Racqueman feared she would be blamed for her daughter's death as she had been warned not to leave her alone with Harris. Miss Johnson said by choosing to leave her daughter in his care, Ms Racqueman had made "a fatal decision". When she was told he had been arrested, she replied: "I know it wasn't me, I've got nothing to do with this, it's not my fault." Jurors were told Ms Racqueman had begun a relationship with Harris, who lived next door, five months before Amina's death and that she trusted him with her daughter.